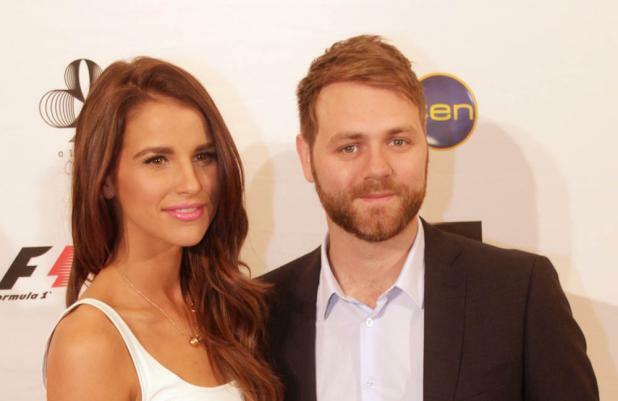 Brian McFadden keeps turning up to 'Stepping Out' rehearsals hungover. The former Westlife singer - who is competing on the ITV dance show with his wife Vogue Williams - admits the pair have struggled in the training sessions because they have felt worse for wear on several occasions. Brian - who has previously admitted his wife can out drink him - told The Sun newspaper: "We woke up hungover on Sunday morning, turned up at the studio to be told what we're doing and had four days to smash it out. I was pretty much sick. But compared to the week before, it wasn't too bad. "With contemporary (dance) we were hungover, we had only had a few hours sleep. I couldn't physically lift Vogue up - I was too tired. We're the only ones who have gone out every week." Despite his struggles, Brian will attempt to 'twerk' - a type of dancing in which the dancer shakes their hips up and down in a bouncing motion - during his routine on Saturday (14.09.13), and is anxious as to whether his children Molly, 12, and 10-year-old Lilly, who he had with ex-wife Kerry Katona, will be embarrassed by the performance. He said: "They are coming down for the show and might be quite embarrassed because I'm going to be acting all gangster and we are both twerking." The new ITV show - which rivals BBC One's 'Strictly Come Dancing' - sees a number of celebrities including JLS star Oritse Williams and actress Denise Welch team up with their real-life partners to learn and perform difficult choreography.